Its structure is a funnel,a collecting hole for dust on the bottom,on the right side of this hole is equipped with a suction inlet of turbine circulating fan.Send the pumped dust into the bottom of inner chamber and then to the left side and go upwards;blow the dust into test chamber from the left side; the dust should be blown rightwards in a horizontal direction and then begin circulation. 8, sand and dust composition: If there is no other clear provisions, large sand with quartz sand (silica composition in more than 95% by weight). 10, collecting system: the system can automatically collect the falling sand, and enter the box to continue the cycle. 11, box seal: no dust leakage during operation, you can well protect the surrounding environment from pollution. 13, box door: fully open single-wing (1300 × 1300mm), with double silicone rubber seal and door locks. 14, observation window (400 × 600mm) with a protective film heating. 15, automatic vacuum cleaning system. 16, wind speed simulation system: High-power centrifugal fan to produce strong wind, and automatically adjust the wind speed through the inverter. 17, rotating table (diameter 800mm) to 1 rev / min counterclockwise rotation, to provide some slots on the specimen to be fixed. Rotary table motor shaft sealed by O-ring. 18, collectors (funnel-shaped) in the lower part of the test space. 19, the air compressor through the pneumatic valve on the machine to control the switch and air purification. Automatic feedback control: wind speed automatic feedback control adjustment. 7, When the system detects a protective device is activated, it will automatically power off and alarm. 1, Site: the ground level, well-ventilated. No strong vibration around the device, no strong electromagnetic field. No flammable, explosive, corrosive substances and dust around the equipment. Ground bearing capacity: not less than 800kg / ㎡. Around the equipment reserved for about 1500mm operation and maintenance space. 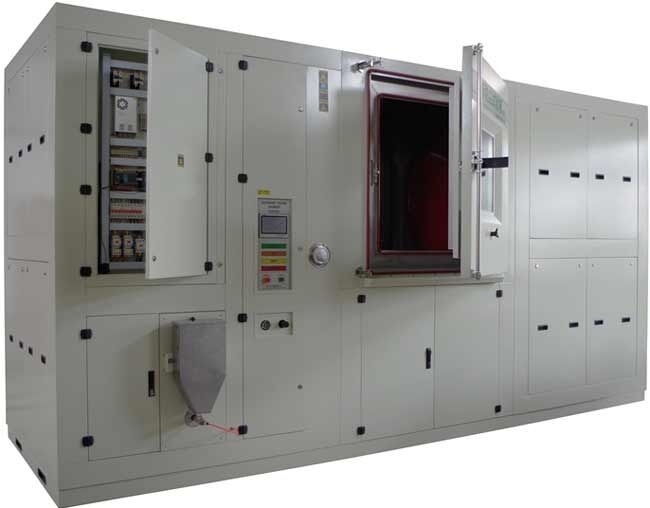 3, power supply conditions: installation power: 125kW, equipped with independent air circuit breaker equipment; supply voltage: 380 V ± 10% / 50Hz / 3ph + N + G; grounding resistance: ≤ 4Ω. 4, circulating cooling water: pressure 2 ~ 4bar, temperature ≤ 30 ℃, flow ≥ 10m³ / h.
5, compressed air: pressure 6 ~ 8bar, dew point ≤-10 ℃, flow rate ≥ 40m³ / h.